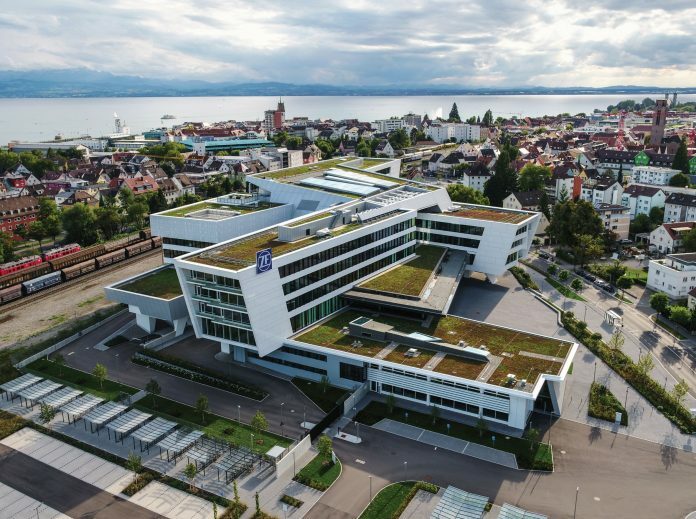 The ZF Forum, headquarters of ZF Friedrichshafen AG in Friedrichshafen on Lake Constance (Germany), provides office workplaces for up to 700 employees. In addition, an exhibition on the ground floor of the building offers an insight into the past, present and future of ZF, its products and technologies. // Das ZF Forum, die Hauptverwaltung der ZF Friedrichshafen AG in Friedrichshafen am Bodensee, bietet Büroarbeitsplätze für bis zu 700 Mitarbeiter. Zudem ermöglicht eine Ausstellung im Erdgeschoss des Gebäudes Einblicke in die Vergangenheit, Gegenwart und Zukunft von ZF, seiner Produkte und Technologien. ZF Friedrichshafen AG, a leading global technology group and supplier of mobility systems for passenger cars, commercial vehicles and industrial technology, today announced that it has entered into a definitive agreement to acquire WABCO for $136.50 per share. The planned acquisition has been approved by ZF’s Management Board and Supervisory Board and WABCO’s Board of Directors. Together, ZF and WABCO will form a leading global integrated mobility systems provider for commercial vehicles, creating added value for ZF’s commercial vehicle customers. The combined company will have sales of approximately €40 billion. WABCO is a leading global supplier of braking control systems, technologies and services that improve safety, efficiency and connectivity of commercial vehicles including trucks, buses and trailers. Its diverse products and services include integrated braking systems and stability control, air suspension systems, transmission automation controls, as well as aerodynamics, telematics, and fleet management solutions. WABCO, which is listed on the New York Stock Exchange, generated €3.3 billion in revenues in 2018 and has some 16,000 employees in 40 countries. The planned strategic acquisition of WABCO is consistent with ZF’s goal to develop and deliver technology solutions that make cars and commercial vehicles see, think and act in order to reduce emissions and increase road safety. While ZF already has sensor systems and computing technology for its “see“ and “think” competence, together with WABCO ZF will in future be completing the portfolio for commercial vehicle technologies to offer solutions to allow vehicles to “act”. ZF is already a leading supplier in the area of steering and driveline technology. The transaction is subject to regulatory approvals, other customary closing conditions and shareholder approval with more than 50 percent of WABCO’s outstanding shares. ZF expects to close the transaction in the beginning of 2020.